Hi there crafters and small business owners! I'm happy to offer licenses to sell for two of my sewing patterns – the Reversible Shoulder Bag and the Foldover Pouch. 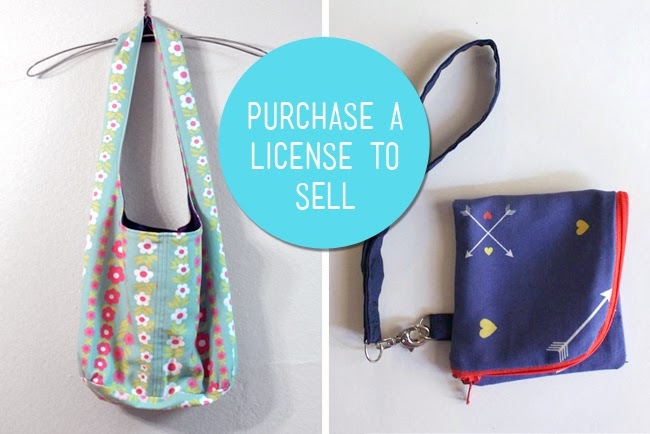 The license gives you the permission to use my pattern to make and sell items for profit. It's just a one time cost of $9. Your receipt serves as proof of license. Email me at lulalouise [a] gmail.com if you have any questions or if you are interested in licensing another pattern or tutorial. If you buy a license I will be happy to link to your shop below. Thank you! A Lula Louise License To Sell is a limited commercial license that allows one person to make and sell handmade items using a specific Lula Louise sewing pattern or tutorial. If you purchase a license and you have a home or online small business, you are entitled to sell items made using the pattern for profit. The license is good for as many items as you the purchaser can personally make and does not need to be renewed. Factory or mass production is strictly prohibited. Purchase of a license DOES NOT entitle the purchaser to sell, copy, or distribute the pattern itself.